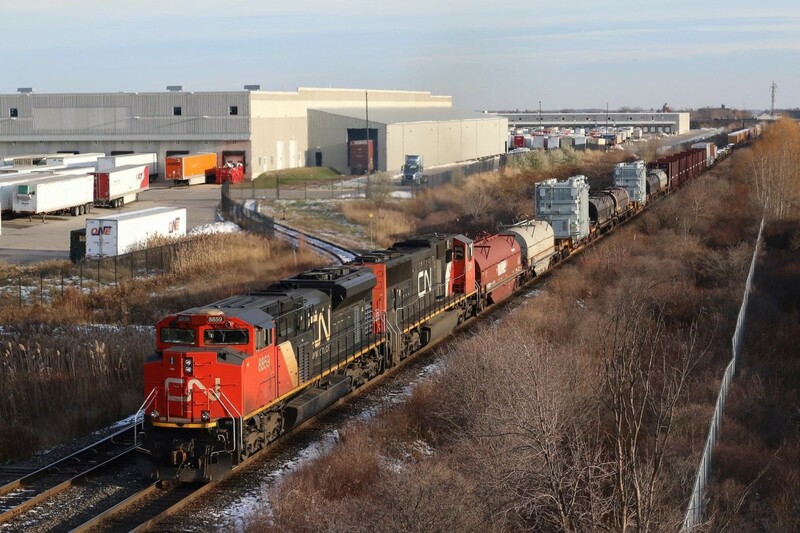 Railpictures.ca - Marcus W Stevens Photo: While the lash up wasn’t the most impressive, it’s always nice catching dimensional loads near the head end, not to mention a GO coach on the tail end. The late day lighting doesn’t hurt either :) Here we see train 422 slowing for a meet with local 551, once the dimentionals clear the passing train the eastbound will notch up to attack the Halton Hills. | Railpictures.ca – Canadian Railway Photography – photographie ferroviaire Canadienne. Caption: While the lash up wasn’t the most impressive, it’s always nice catching dimensional loads near the head end, not to mention a GO coach on the tail end. The late day lighting doesn’t hurt either :) Here we see train 422 slowing for a meet with local 551, once the dimentionals clear the passing train the eastbound will notch up to attack the Halton Hills. Coil cars for buffers.. very nice. And I love the boxcar sticking out from the industry. Very model railroad like..”yep, there’s a car in there”. Depending on the type of dimensional load being carried they are required to be at the head end of the train. Also again depending on the load, if a train with a DIM is passing another train, one train has to be stopped and the one moving has to slow to 10 mph until the DIM has passed.